Veterans’ Council Senator Guy Mandeville C.D. When Irene Robitaille, a Métis Nation of Ontario (MNO) citizen from Penetanguishene, was visiting a friend in the hospital, the patient in the next bed was cold, so she set out to find a blanket. Even with the extra blanket, the man, whom she learned was a veteran, was still cold. On her next visit to the hospital, she gave him a fleece honour blanket that she had made. 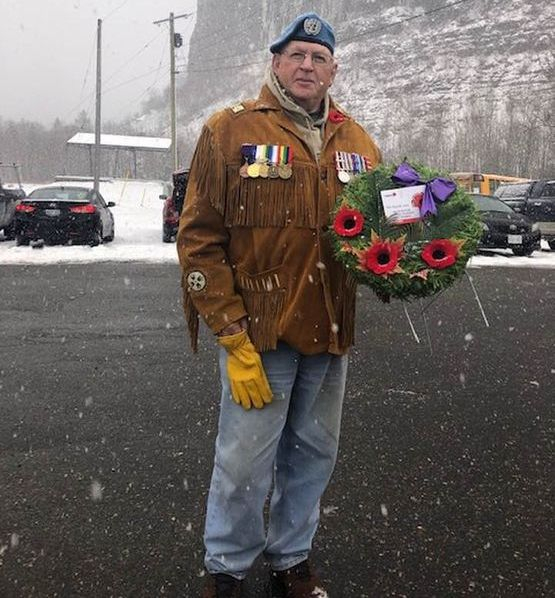 He was so grateful that she thought of Métis veterans and was inspired to make 30 more for the MNO Veterans’ Council to present to Métis veterans to honour their contributions. 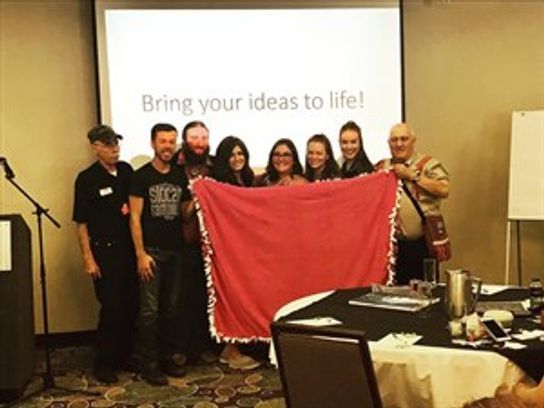 One of those blankets was presented to the MNO Youth Council by the MNO Veterans’ Council at the MNO Annual General Assembly in Peterborough. 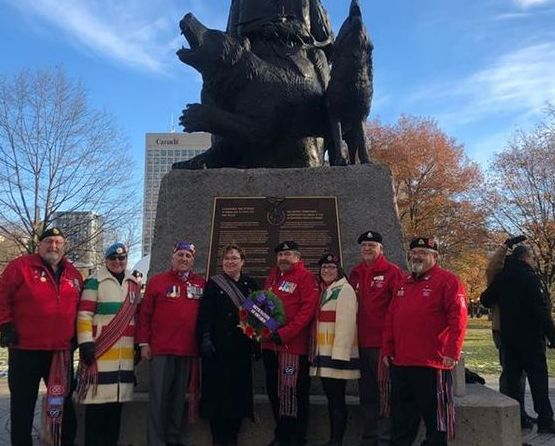 The MNO Veterans’ Council puts great energy into supporting the development of Métis youth, educating them on Canadian Forces careers and keeping the torch of remembrance burning. 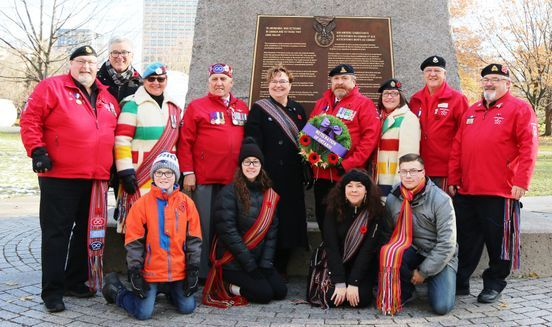 The blanket is a symbol of the support and guidance the MNO Veterans’ Council provides Métis youth and the blanket will honour Métis youth who choose to serve in the Canadian Forces. The special gift has sparked the idea for a province wide beading project, which is still being developed. 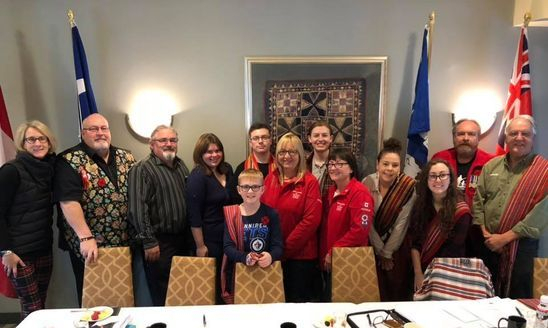 “We'll be asking Métis youth from across the province to bead and then send us a flower of any shape, size, pattern or colours,” said Region 2 Youth Representative Paul Robitaille in an email. “We are also encouraging them to tell us why that flower/pattern is meaningful to them. From there, the MNO Youth Council will arrange and sew the flowers onto the blanket and then connect them using beadwork to form one cohesive piece. 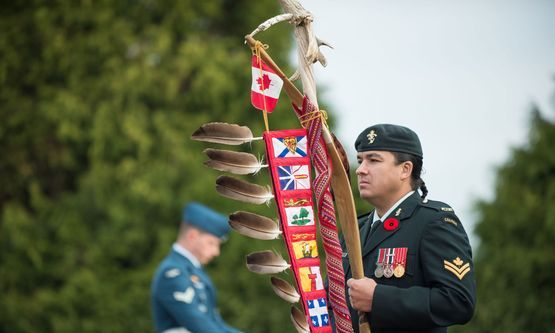 We recognize the unique experiences of Indigenous Service Members and Veterans. 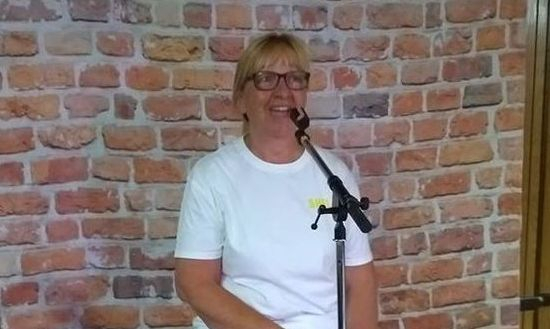 What a great event....my "So You Think You Can Sing" fundraiser was a huge success. The food was great,the bar was busy,we had over 35 singers, endless number of dancers and the band (Crowbar Hotel) out did themselves.Thank you to Brenda Desjardins for helping me sell out of tickets,various friends who donated spot dance,raffle and door prize gifts. 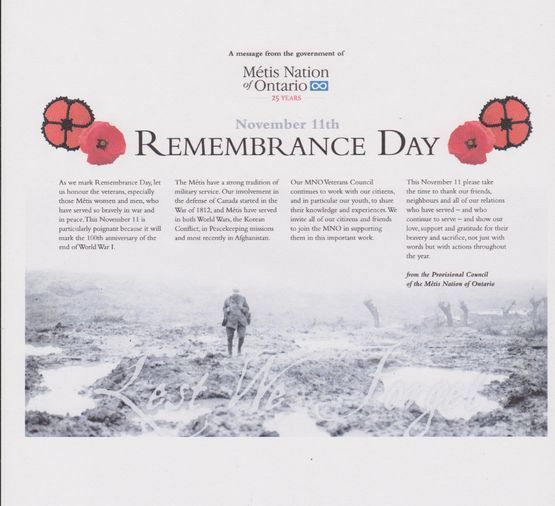 The Métis Nation of Ontario Veterans’ Council (MNOVC) is interested in your experience. For any MNO youths that have attended the Military Black Bear, Bold Eagle, Raven or Aloy programs, or chose to enlist in the Regular Armed Forces or Reserves, we the MNOVC would like to hear about your experience. 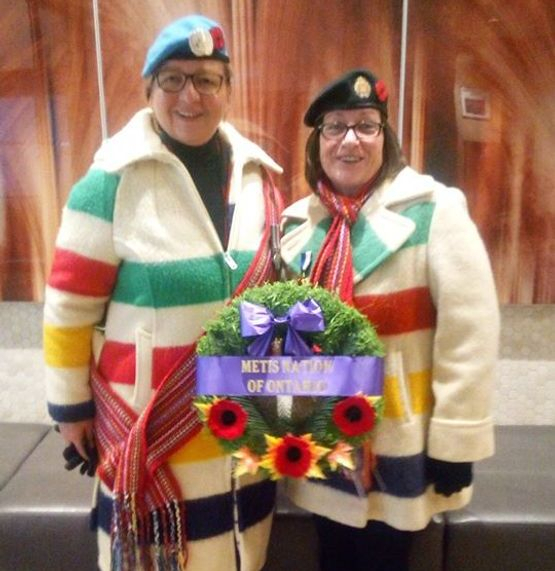 Please submit a one to two page story of your experience and we will be adding it to our second Metis Veterans book. Please outline which branch (army, navy or air force) you served with along with length of service. Did you take courses, received promotions or encouraged others to follow suit. What was your overall experience? Were you able to apply your military experience to civilian life? Did your military experience help you achieve your goals? Was there Aboriginal content that spoke to you. On the 26TH June 2018 at 1030 hours, the Canadian Forces Postal Unit, CFB Trenton held a Change of Command parade at Baker Island, 47 Island Park Drive, Trenton ON. Guests were seated by 1020 hours. The ceremony was presided by the Commander of the Canadian Forces Joint Operational Support Group, Colonel Carla Harding, CD. Major Jane Ann Swim, CD will relinquish command of the unit to Major Pauline Hancock, CD. The Change of Command was followed by a reception. Metis Nation of Ontario Veterans Council Senator Guy Mandeville, CD was an invited guest to witness the Change of Command between Major Swim and Major Hancock. 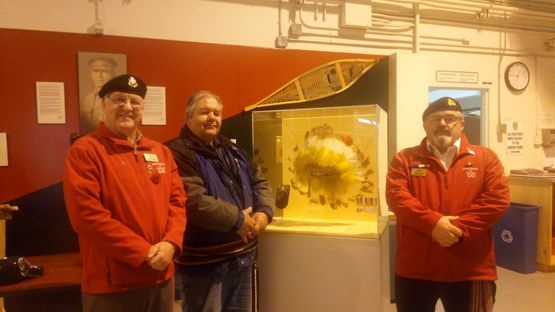 Senator Guy Mandeville has been an avid supporter of the Canadian Forces Postal Unit at CFB Trenton and since his retirement from the Canadian Forces has worked in many roles within the CF Postal Unit doing jobs such Postal Museum curator, historian etc. 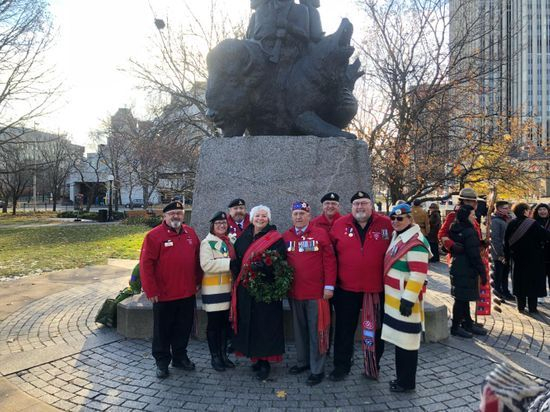 Grand River Council Senator Carol Lévis, Grand River Council President Jennifer Parkinson, MNO Veterans Council Senator Guy Mandeville CD, Grand River Councillor Diane Kilby and Grand River Treasurer Leslie Muma. The Grand River Metis Council in conjunction with the Kitchener/Waterloo Region Museum at 10 Huron Rd, Kitchener, Ontario on the 18th June 2018 viewed the film “Women in the Shadows” a 1991, 55 minutes National Film Board (NFB) film directed by Norma Bailey and written and filmed by Christine Welsh to “Reconcile with her Metis Past”. Filmed on location in Saskatchewan from the Qu’Appelle Valley to Hudson Bay, the documentary traces the filmmaker’s quest for her Native foremothers in spite of the reluctance to speak about Native roots on the part of her relatives. The film articulates Metis women’s experience with racism in both current and historical context, and examines the forces that pushed them into the shadows. After the viewing, David Neufeld, Education Coordinator at the Waterloo Region Museum held a panel discussion with question from the audience. 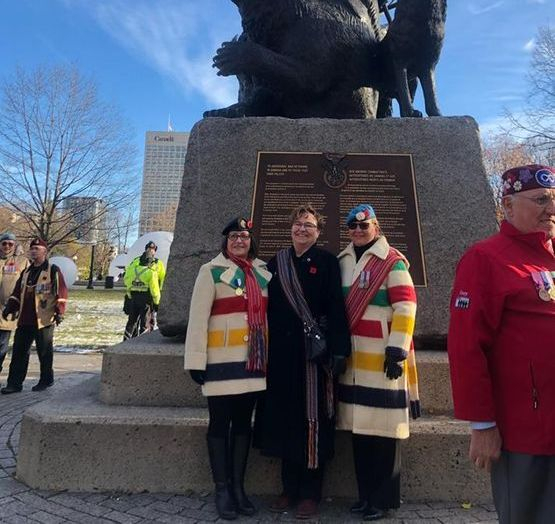 The panel consisted of Grand River Council President Jennifer Parkinson, Councillor Diane Kilby and MNO Veterans Council Senator Guy Mandeville. The evening was very enjoyable with many questions being asked and replied. The audience found it very insightful and many did not the realize that the Metis hid their identity for fear of being branded traitors to Canada since the Northwest Rebellion of 1885. The Metis coming of age arrived with the repatriation of Canada’s Constitution in 1982. We are still struggling with Provincial and Federal Governments for real recognition/reconciallation. This film even though made in 1991 is still relevant today and should be viewed by all Metis as it is an eye opener and will bring to the forefront why some of our parents would not confide in their children their ancestry. All Metis present expressed their pride in the Metis Nation and thanked the Kitchener Museum for their support in the National Indigenous Week presentations. along to anyone of interest. services they need when and where they need it. Clinic service site in Kingston, Ontario. Clinic services in the greater Kingston area. the Canadian Armed Forces (CAF) or as a member of the RCMP. Calgary, Fredericton, Vancouver, Edmonton, Ottawa, and Dartmouth. closer to locations where Veterans live. Victoria, British Columbia, on May 31. 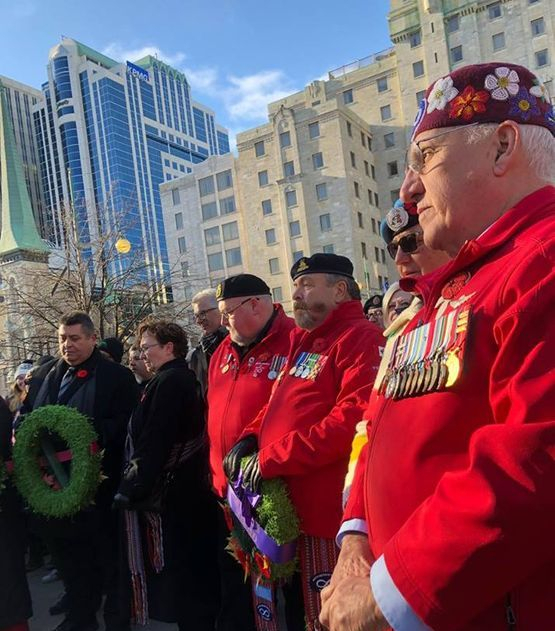 Services offered to Indigenous veterans who served with the Royal Canadian Mounted Police by Veterans Affairs Canada. 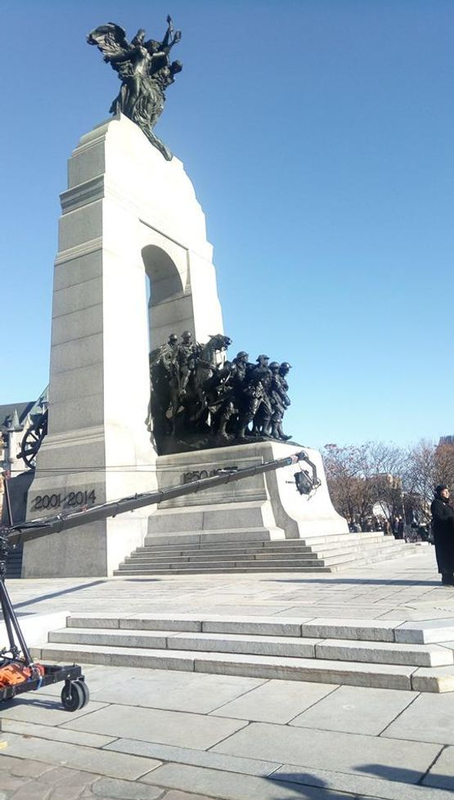 At the conclusion of this study, a report will be tabled in the House of Commons containing recommendations to the government on the benefits and services offered to Indigenous veterans. Organizations and veterans interested in taking part in this study are invited to express their interest by email to [email protected] by May 22, 2018. For more information on the study of Needs and Issues Specific to Indigenous Veterans: https://bit.ly/2wjWMAI. Metis Flower Decals .....................only $5.00 each. 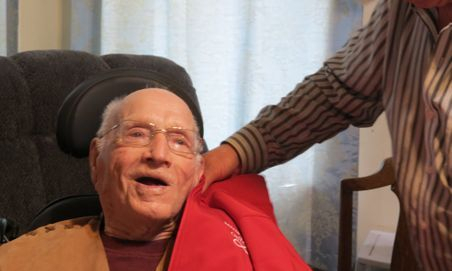 Veteran Alexander Boucher celebrated his 105th birthday last Saturday in Britt. 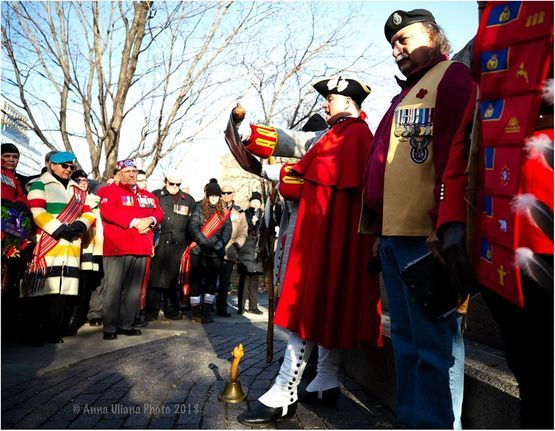 What a special day for Alex being the oldest Aboriginal Veteran in Canada. He was presented the Order of the Sash by MNO President Margaret Froh and the Metis commemorative statue (presented by MNOVC Secretary/Treasurer Greg Garratt) of the Aboriginal Monument which is located in Penetanguishene, Ontario.The MNOVC was able to orchestrate to have representatives of the MNOVC attend this very special day. Many gift were presented, including a special quilt from Quilt of Valour by MNOVC Women's Rep Shelly Claus. Also in attend was Brian Black MNOVC Chair and several family members as well as friends.